Tile flooring is a stylish and durable flooring solution. Its affordability makes it ideal for flooring projects of every size, spanning from a single room to the entire home. Although we offer an inventory stocked with products from the industry’s leading brands, our tile is accompanied by the most reasonable price tags in the area. By utilizing the buying power of the Flooring America name, our store saves on high-end tile and passes these savings along to customers like you. Depend on our tile flooring in Hooksett, NH, and tile specialists to help you find the right tile for your space at the right price. In addition, our store technicians know how to install tile so that it looks great and lasts long. From wine spills to home painting projects, your house is meant to be lived in. As your children grow and your pets play, you don’t want to stop the fun because you’re worried about the floors. Live life the way you want to in your entire home by purchasing our family and pet-friendly tile flooring. We offer tile products with an impressive resistance to the most common forms of damage experienced in the home. Tile remains a low-maintenance flooring option. Keep your new floors looking their best with occasional sweeping and mopping. More and more customers are drawn to tile because it remains one of the most durable and long-lasting surfaces available. Our showroom features a wide range of materials, so you are able to shop with confidence knowing that we carry the perfect product to match your unique tastes, style, and decor. Glass: For artistic accents, colorful details, and bathroom décor, this material mimics the look of a mosaic. In addition to using it as an artistic element, some clients purchase glass tile for their entire space. Stone: This option still remains a classic. From varying colors to unique patterns, stone tile comes in all types to match your décor. Vinyl: One of the lowest-cost tile options available is vinyl sheets. 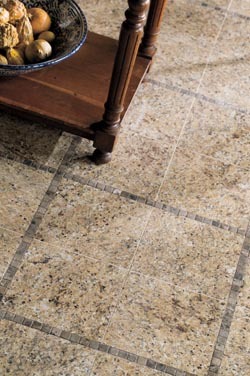 It perfectly mimics the look and feel of tile, and is incredibly moisture-resistant. Porcelain is a highly dense material that is able to withstand years of wear and tear. Its naturally beautiful appearance enables it to enhance any space, as well as fit seamlessly with existing design elements. The sleek look and feel of porcelain tile make it a perfect material for homeowners interested in creating a modern space. Few things increase the value of your home the way that a kitchen or bathroom remodel does. That is why you should consider our porcelain tiles for bathrooms. You are able to add a charming look that is beautiful yet functional at the same time. Because of the higher temperatures porcelain is created with, these tiles are the durable and waterproof solution your home needs. Ceramic tile flooring is often compared to natural stone tile because of its similar appearance. The surface of ceramic is available in smooth or pockmarked textures depending on your preference. Whether you are interested in a warm and earthy look, or a classic and timeless surface, this material is available in a variety of appealing colors and patterns. A tile floor made of ceramic is suitable for virtually any room of your home. These days it is possible to get ceramic tile that has the look of wood flooring as well. Just like wood, our tile comes in a number of different shades and styles, and even has grain texture as well. Best of all, unlike wood flooring tile is completely waterproof which makes it ideal for kitchens, bathrooms, and basements. Now you are able to have the look of wood in any room you want. Slate tile adds a look of grandeur that is hard to beat. If you really want to impress your houseguests and increase your home’s resale value you should consider slate floor installation. Since slate is a natural flooring material that has been used for hundreds of years, it has a beauty and elegance that is irresistible. The natural material also means that no two floors are exactly the same, giving your home a unique look that is yours alone. Our experts know how to install tile. With years of experience in ceramic tile installation, we give our customers peace of mind that the job is going to be done right the first time. It is essential that tile is installed correctly, because while the material may be durable, if it isn’t laid correctly it could easily crack under pressure. Our installers are experienced and skilled at slate floor installations as well. Our priority is always for you to be completely satisfied, which is why we back every completed tile floor installation with the Lifetime Installation Guarantee. If you determine you are unhappy with any installation-related aspect of your new tile, you can take advantage of the guarantee for the life of your floors. We come out to your home and fix the problem at no charge to you. Contact us for all of your tile needs. We serve the residential flooring needs of clients throughout Hooksett, New Hampshire.